The ground floor apartment of approx. 80 m² extends over the entire ground floor of a town house of the century turn, away from the noise of the street, in a villa district centrally located between city park and old town. Stylish decor with nostalgic elements, pitchpine floorboards, antique tiled stove in the living room, bathtub, balcony, garden, incl. Internet connection via W-LAN, free parking in the street at the house. The entrance hall separates the apartment into two areas: on the one side the living room with balcony and living room, on the other the two bedrooms with bathroom. One bedroom is equipped with a double bed. Each bed has a bedside table with a reading lamp and a fluffy carpet in front of it. In front of a Retrotapete is a makeup point with oval mirror. A three-door wardrobe offers space. The bedroom has access to a small wooden terrace with table and two chairs from which is reached via a small staircase the garden. The other bedroom has a walk-in closet and is equipped with two single beds, each with dessert and reading lamp. The bathroom and separate WC are next to the bedrooms. The bathroom has a tub with rain shower, a towel radiator, washbasin with two drawers and large illuminated mirror. On the other side of the long plank is the living room. It is a high gloss kitchen with cooking island. A refrigerator incl. Freezer, sink, dishwasher and a pot are located on the wall. The stove with ceramic hob and an oven together with two drawer cabinets forms the cooking island. The kitchens include: a coffee maker, a toaster, a milk frother and a water cooker. A Saeco fully automatic coffee machine ensures freshly ground coffee. The dishes and cutlery are for 12 people so that the dishwasher can also be fed. In addition there are coffee cups, Michkaffeetassen, müslischalen, serving dishes and all necessary items for cooking such as potato steamer, can opener, corkscrew, savory, blender, cooking spoon, garlic press, decent knives etc. The pots are also from WMF. Just behind the cooking island is a large dark wooden table. Above him is a beautiful chandelier with 12 lights, which can be dimmed infinitely. At the table are 6 upholstered chairs with high backrest. From the dining room is the adjacent covered balcony with wooden furniture accessible. From the dining room it goes through an antique sliding door into the living room. An antique ceiling-high tiled stove dominates the room. A basket of firewood with small wood and fireplaces to fire the fireplace is available free of charge, additional wood can be ordered for a fee. A 45`FlachbildTV and an XXL couch provide for relaxation. Perfect location , 10 mins walk to the old town. Barbara met us at the apartment and thoroughly reviewed everything with us. She is very nice, helpful, and easy to contact. Parking was available on street near apartment. Apartment was very clean and nicely decorated. The kitchen is well appointed. I did need to use Google to learn how to operate the stovetop but everything else was self-explanatory. Even though street repairs were being done the apartment was very quiet and peaceful. It was an easy walk to Lubeck with many historical sites, restaurants and shops. Our family of four including a child and grandparent were very comfortable here. We would stay at this property again. This apartment is highly recommendable for anyone wanting to visit the charming town of Lübeck. 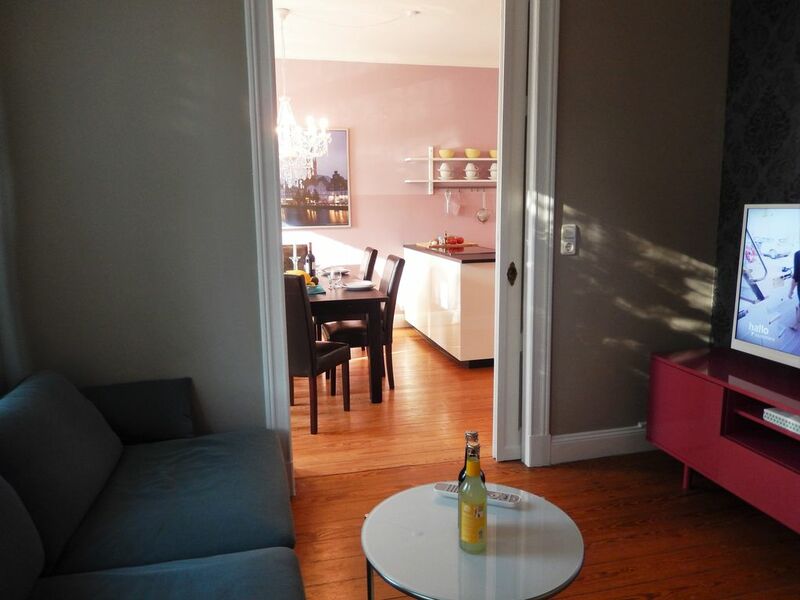 The apartment is 10 mins walking distance from the city center and is on a very quiet street. The owner is kind, polite and gives accurate information. The apartment is clean and cozy. It has a well functioning fire-place and a good sized bath tub. I really only have good things to say about the rooms and the kitchen. I recommend visiting the small restaurent 'Erdapfel' located 15 mins from the apartment. Gute Lage, in 20 Minuten in der Lübecker Innenstadt. Vorhänge könnten etwas mehr Dunkelheit spenden. Sehr gepflegte, große, voll ausgestattete Ferienwohnung und nur wenige Minuten Fußweg bis zur Altstadt. Wir kommen gerne wieder. Wir waren schon mehrere Male in dieser Wohnung. Es fehlt dort an nichts und sie ist sehr liebevoll eingerichtet. An und Abreise aufgrund von einer Schlüsselbox unkompliziert. Stylish old building floor 80 m² over the entire ground floor of a town house of the turn of the century, far away from the street noise, in a villa quarter centrally located between city park and old town island. The ideal starting point to fully enjoy all facets of a successful holiday in Lübeck on the Baltic Sea: in the middle between relaxation on the beach, cultural offer of medieval Lübeck and the sophisticated ambience of the immediate area. CITY PARK: In the immediate vicinity is the city park from the 19th Century. With its winding paths, past water surfaces and islands, it is a beautiful backdrop for evening walks or jogging rounds! Just a street corner further, just before the city park, there is a nice playground, a basketball and football field. OLD TOWN: The castle gate, one of the entrances to the Old Town is just a short walk away. The old town of Lübeck is a UNESCO World Heritage Site. Its medieval ambience conjures back past times. Many small cafes are waiting for discovery. There is a varied cultural offer; many museums, theaters, concerts of all genres, cinemas and program cinemas. The shopping experience in Hüxstraße, with its many exclusive boutiques, is known far beyond Lübeck's borders. A perfect start to culture and shopping, the Cafe-Bar-Celona about 1.2 km away, www. cafe-bar-celona. de, it is located directly on the banks of the Trave in an old harbor store with a beautiful view of the old town. NATURE EXPERIENCE WAKENITZ: Who wants to Lübeck on the water, does not have to the Baltic Sea. The Wakenitz (affectionately called the Amazon of the north) is a clean river that flows from the Ratzeburg lake, past the old town. The course of the river is dammed up with lake-like expansions overgrown with reeds and water lily fields. At more than half the length, it once marked the inner German border. Since the eastern shore was not entered for decades, the originality of the river landscape is impressive. With a bit of luck you might spot Nandus, South American ostriches, who escaped from a breeding enclosure and found a new home in the Wakenitz lowlands. For nature lovers a special experience that can be experienced in different ways: individually with a canoe or quite comfortably on a pleasure boat. The Canoe Central Lübeck www. canoe-centralized. de provides the canoes at the desired location. At the jetties Moltkebrücke (distance from the house about 2.5 km) and Untertrave (1.8 km) you can go on Wakenitzfahrt, get off on the wild banks and hiking or visit Ratzeburg, more details at www. Wakenitz ride. de. At the Moltkebrücke there is also a lending station for pedal boats, rowing boats or electric boats. So the day can be fully individually loaded with picnic basket and bathing suits spend on the river in search of the perfect swimming spot. At the old town there are natural river swimming pools on both banks (both with 3m diving tower). The www. Naturbad-hawk meadow. info is within easy walking distance (1.6 km). The bathhouse of 1899 is a listed building. In the summer, their authentic ambience becomes the backdrop for popular cultural events, such as theater and concerts. The Wakenitz flows about 200 meters away past the house, however, the facing shore is lined by villas whose land reaches to the water. A little further upstream, the banks are accessible, so you can enjoy the peaceful atmosphere during a walk or a picnic. Longing OSTSEE: "Holidays on the lake! Does anyone have a word about it, what luck that meant? "Thomas Mann, from his novel Buddenbrooks. In any weather, the Baltic Sea beach is worth a visit. A paradise for sunbathers, water rats, beachcombers and those seeking relaxation. The nearest station of Travemünde can be easily reached by bus (bus stop in approx. 200 m). In the traditional Baltic resort with its sophisticated villas along the beach promenade, the splendor of the old days is preserved. It is a pleasure in one of the many cafes at the port, to look at the ships close by at hand. West of the spa beach begins the Brodtner shore, a steep coast with unspoilt beach. Here begins the Baltic Sea Cycle Route, which reaches as far as Flensburg. A wonderful hike along the water edge or above the cliff leads to the nearest seaside resort Niendorf. In the idyllic Niendorf harbor fishermen sell the day catch directly from the boat. Behind the harbor begins Timmendorfer beach.